Business owners and marketing directors curious how an advertising agency evaluates a client’s business and then develops an advertising campaign now have access to an actual client sample of an agency’s analysis, recommendations, and the positioning and messaging involved in writing and producing a national radio adverting campaign, including fully produced radio commercials and radio scripts. "Radio Advertising can be the most efficient and cost effective way to have an immediate impact on a company's sales and marketing. On the flip side, it can also be the most costly and ineffective if poorly executed," Jeff Mustard, Advertising Executive. This detailed, eye-opening creative brief reveals analysis of the competitive space, parses the psychological approach to marketing and provides insights into numerous strategic arenas that must be considered and evaluated when an agency, or in-house marketing director, is seeking to establish a mass media marketing message coupled with the company’s approach to market. 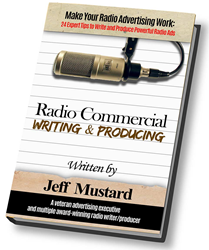 "Make Your Radio Advertising Work: 24 Expert Tips to Write and Produce Powerful Radio Ads," is a must-read for any company contemplating the use of radio advertising, or presently using radio advertising. Packed with valuable information this exceptional tutorial cuts to the quick with “24 Expert Tips" guaranteed to have an immediate impact on improving the results of any company's radio campaign, will help increase leads and generate more sales. Jeff Mustard is an advertising executive with more than 25 years of experience in all facets of the broadcast communications arena and the principle of three media companies—advertising/marketing/public relations, (http://www.TheBambooAgency.com), radio writing and radio commercial production (http://www.TheRadioProducers.com), and video writing and production for sales/marketing videos and television commercials (http://www.TheDocumentaryProducers.com). His unique multi-channel, multi-media, integrated advertising, marketing and public relations campaigns utilize the complete spectrum of today’s technologies and media platforms. Mr. Mustard’s work has aired locally, regionally and nationally on behalf of local, regional and national clients. His creative strategies have helped to completely rebrand, and reposition companies in the marketplace; his advertising and marketing successes have generated tens of thousands of leads, enhancing branding, improving sales and, most importantly, increasing client ROI.